Tunnel Falls is located 5.9 miles from Eagle Creek Trailhead in the Mark O. Hatfield Wilderness. This unique waterfall plunges 165' over basalt cliffs along East Fork Eagle Creek, distinguished by the namesake tunnel which passes directly behind it. The Eagle Creek Trail rises steadily through diverse forests highlighted by scenic bridges, steep drops and several iconic waterfalls en route to Tunnel Falls. It continues 7.2 miles to Wahtum Lake, with multiple connections for loops and longer trips in the Hatfield Wilderness. The Eagle Creek - Punchbowl Falls - Tunnel Falls corridor sees heavy crowds, especially on weekends. Short sections run across narrow paths etched in vertical cliffs, and may not be suitable for children or those fearful of heights. Keep pets leashed at all times. The Eagle Creek Trail heads SE and crosses the first of several cable-aided cliffs (1.0 miles : 460'). 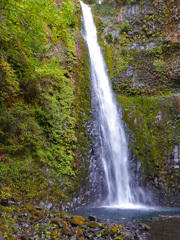 It reaches a spur for Metlako Falls (1.45 miles), a 150' fall named after the goddess of salmon. The ECT hairpins across Sorenson Creek to the split for Lower Punchbowl Falls (1.75 miles : 504'); skip this and continue .18 miles to a good aerial view over the aptly-named bowl. The trail dips to a bridge over Tish Creek (2.0 miles : 550'), which is damaged and set for repair. Cross the creek on an interim path to an intact bridge over a narrow, maple covered gorge (2.55 miles : 588'). The trail tip-toes another narrow, cable-aided ledge (2.9 miles) to High Bridge, set 150' over a narrow gorge (3.2 miles : 563'). Enjoy useful perspective from this airy perch in the middle of the canyon. The trail continues up the west bank of Eagle Creek to Skoonichuck Falls (3.6 miles), the top of which is easy to reach but with a more concealed (and precariously viewed) plunge. It crosses back to the east bank on a long bridge (3.9 miles : 792'), then closely follows the creek past a burn sign (4.35 miles) and campsite (4.58 miles : 885') to the Mark O. Hatfield Wilderness Boundary (4.75 miles : 963'). Complete and carry the free (but required) permit for travel beyond this point. It levels to the Eagle - Benson Trail split (5.05 miles : 980'), which breaks NE to Wy'east Falls and the PCT. The Eagle Creek Trail keeps straight, then wraps high above the canyon floor on a narrow path to Tunnel Falls (5.9 miles : 1,257'). Tread carefully as you approach and pass behind on a narrow, wet path. Use cables for safety and avoid unstable ledges. It's tempting to lean over for more of a view, but this is strongly discouraged and fatal accidents really do happen (pets included). Round this narrow alcove to Twister Falls (6.2 miles), which swirl through wide, tiered pools before sliding through a precipitous slot along Eagle Creek. Control children and pets along narrow, cable-aided ledges. Scrambling off trail to access Tunnel Falls' plunge pool is strongly discouraged. A valid Recreation Pass is required to access the Eagle Creek Trailhead ($5 day use fee | overnight use requires payment for two days). Complete the form and display as directed at the trailhead board. A free day and overnight permit is also required to enter the Mark O. Hatfield Wilderness. These forms are available at the wilderness boundary, 4.75 miles from the trailhead along the Eagle Creek Trail. Complete the form and carry with you as directed. Diving into the pools of Punchbowl Falls is strictly probibited. A $300 fine will be applied. The Eagle Creek Trailhead is located off Exit #41 from I-84. Take Exit #41. At the bottom of the ramp, turn right and go .5 miles to the end of the road. This road crosses a footbridge which leads to Wauna Viewpoint before narrowing into one lane. Drive slowly and anticipate oncoming traffic.